Before 1723: disciple of Ôtani Hiroji I, he started his career as a koyaku and his first stage name was Ôtani Rokuzô. 11th lunar month of 1723: he became wakashugata and performed at the Nakamuraza in the kaomise drama "Sono Enpô Onna Migyôsho", which celebrated the arrival of the Kamigata actors Yamashita Kinsaku I and Sanogawa Senzô. 1733: adopted by the playwright Tsuuchi Jihê II, he took the name of Tsuuchi Monzaburô I. 11th lunar month of 1735: Monzaburô played at the Nakamuraza the role of Mita no Genta Hirotsuna in the kaomise drama "Tono Zukuri Shinoda Zuma". Fall 1738: Monzaburô went to Kamigata, along with his adoptive father Tsuuchi Jihê II and Bandô Hikosaburô I. 11th lunar month of 1738: Monzaburô played at the Ônishi no Shibai the role of Arajishi Otokonosuke, in reality the governor (kami) of Iga Shinozuka, in the kaomise drama "Kusunoki Yakata Sennen Gitsune" , which was produced in Ôsaka by Yoshizawa Ayame II. 1st lunar month of 1739: Monzaburô's rank in the Ôsaka hyôbanki, tachiyaku section, was jô-jô-(shiro)kichi (superior - superior - (white) excellent). Fall 1740: Monzaburô went back to Edo, along with Bandô Hikosaburô I. 11th lunar month of 1740: Monzaburô played at the Ichimuraza the role of Murei no Ikkaku, in realiy Akamatsu Mushanosuke, in the kaomise drama "Kichirei Imagawajô", which welcomed in Edo the Kamigata actor Matsushima Moheiji. 1st lunar month of 1741: Monzaburô played in the same theater the role of Soga Gorô Tokimune in the new year sogamono "Wakamidori Kaneiri Soga"; the roles of Soga Jûrô Sukenari, Kudô Saemon Suketsune, Kewaizaka no Shôshô (Gorô's lover) and Ôiso no Tora (Jûrô's lover) are played by Ichimura Uzaemon VIII, Matsumoto Kôshirô II, Sawamura Shigenoi and Segawa Kikujirô I. 3rd lunar month of 1741: Monzaburô's rank in the Edo hyôbanki, tachiyaku section, was jô-jô-(hanshiro)kichi (superior - superior - almost excellent) [visual]. He shared the same rank with Ichikawa Danjûrô III, Sakata Tôjûrô III and Sanjô Kantarô II. 11th lunar month of 1741: Monzaburô played at the Kawarasakiza the role of Aoto Gorô in the kaomise drama "Konrei Sakae no Hachinoki". Fall 1742: Monzaburô went to Kyôto. 11th lunar month of 1742: Monzaburô's names was displayed on the signboards of two Kyôto theaters, Hayagumo Chôdayû's theater and Ebisuya Kichirôbê's theater, as he was expected to spend half of the season in the former and half of the season in the latter. He played at Hayagumo Chôdayû's theater the role of Môri Kazusanosuke in the kaomise drama "Ômi Genji Taihei no Kachidoki", which was produced by Hanakawa Ichinojô and welcomed in the Imperial City the actor Nakamura Utaemon I. 1st lunar month of 1743: Monzaburô's rank in the Kyôto hyôbanki, tachiyaku section, was jô-jô-(hanshiro)kichi (superior - superior - almost excellent) [visual]. He shared the same rank with Shinozuka Kazaemon and Tamiya Jûzaburô I. Fall 1743: Monzaburô went to Ôsaka. 11th lunar month of 1743: Monzaburô played at the Kado no Shibai the roles of Kinpira and Ikuno Daisaku (in reality Usui Sadakage) in the kaomise drama "Tanshû Teteuchi Guri". 1st lunar month of 1744: Monzaburô's rank in the Ôsaka hyôbanki, tachiyaku section, was jô-jô-(hanshiro)kichi (superior - superior - almost excellent) [visual]. He shared the same rank with Shinozuka Jirozaemon, Somenoi Hanshirô II, Sakurayama Shirosaburô II and Yamashita Matashirô I. 11th lunar month of 1744: Monzaburô performed the Naka no Shibai in the kaomise drama "Keisei Makura Gundan", which was produced by Anegawa Shinshirô I. Fall 1745: Monzaburô went back to Edo. 11th lunar month of 1745: Monzaburô played at the Moritaza the role of Chibanosuke in the kaomise drama "Chikyôdai Izu Nikki". 1st lunar month of 1746: Monzaburô's rank in the Edo hyôbanki, tachiyaku section, was one black stroke below jô-jô-(hanshiro)kichi (superior - superior - almost excellent) [visual]. 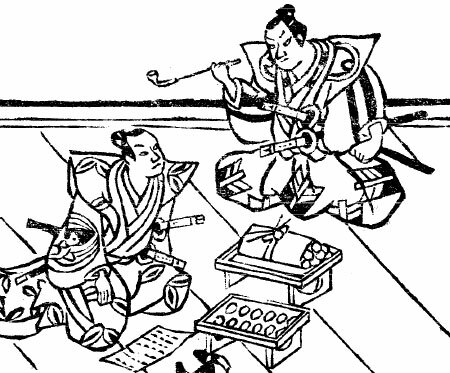 11th lunar month of 1746: Monzaburô performed at the Moritaza in the kaomise drama "Ôtorii Gojûshigun". 1st lunar month of 1747: Monzaburô's rank in the Edo hyôbanki, tachiyaku section, fell to jô-jô-(shiro)kichi (superior - superior - (white) excellent). 11th lunar month of 1747: Monzaburô performed at the Ichimuraza in the kaomise drama "Shusse Momijigari". 1st lunar month of 1748: Monzaburô's rank in the Edo hyôbanki, tachiyaku section, was jô-jô-kichi (superior - superior - excellent). He shared the same rank with Ôtani Oniji I, Yamamoto Kyôshirô I and Nakamura Shichisaburô II. 11th lunar month of 1748: Monzaburô performed at the Ichimuraza in Tsuuchi Jihê II's kaomise drama "Hôkasô Yunzei Hachinoki", which celebrated the shûmei of Ôtani Hiroji II. 5th lunar month of 1749: Monzaburô played in the same theater the roles of Teraoka Heiemon and Hara Gôemon in the drama "Kanadehon Chûshingura". 11th lunar month of 1749: Monzaburô became jitsuaku and played at the Nakamuraza the role of Sagami no Jirô in the kaomise drama "Onnô Taiheiki". 1st lunar month of 1750: Monzaburô's rank in the Edo hyôbanki, jitsuaku section, was jô-jô-(shiro)kichi (superior - superior - (white) excellent). He shared the same rank with Sakata Tôjûrô III. 11th lunar month of 1750: Monzaburô switched back to tachiyaku roles and played at the Nakamuraza the roles of Saitô no Sanemori and Osaragi Gonzô in Tsuuchi Jihê II's kaomise drama "Wakaki no Ume Taira no Kiyomori". 1st lunar month of 1751: Monzaburô's rank in the Edo hyôbanki, tachiyaku section, was jô-jô-kichi (superior - superior - excellent). He shared the same rank with Ôtani Hiroji II and Nakamura Shichisaburô II. Monzaburô played in the same theater the role of Kajiwara Heizô Kagetoki in the new year drama "Izu Kosode Shôbai Kagami". 11th lunar month of 1751: Tsuuchi Monzaburô I took the name of Tsuyama Yûzô I  at the Moritaza, performing in Tsuuchi Jihê II's kaomise drama "Aizuchi Jûnidan", which also celebrated the shûmei of Morita Kan'ya VI. 1st lunar month of 1752: Yûzô's rank in the Edo hyôbanki, tachiyaku section, was jô-jô-kichi (superior - superior - excellent). He shared the same rank with Ôtani Hiroji II, Matsumoto Kôshirô II and Nakamura Shichisaburô II. 11th lunar month of 1752: Yûzô became jitsuaku and played at the Ichimuraza the role of Takebe Gennai in Tsuuchi Jihê II's kaomise drama "Ume Sakura Ninin Semimaru". 1st lunar month of 1753: Yûzô's rank in the Edo hyôbanki, jitsuaku section, was jô-jô-kichi (superior - superior - excellent). He shared the same rank with Nakamura Sukegorô I. Yûzô played in the same theater the roles of Kakogawa Honzô and Kyô no Kojirô in Tsuuchi Jihê II's new year sogamono "Haru Fukami Iroha Soga" . 2nd day of the 9th lunar month of 1753 : Yûzô died in Edo. His tombstone was located in the precincts of the Renkôji Temple in Asakusa. Tsuyama Yûzô I was a talented and popular Edo actor, who was active from the beginning of the 1720s to the beginning of the 1750s. He went twice to Kamigata, where he spent 4 seasons. He was jô-jô-kichi for five seasons, four times as a tachiyaku and one time as a jitsuaku. He was able to perform a wide range of roles and he was outstanding in aragoto and jitsugoto. The 2nd day of the 9th lunar month of the 3rd year of the Hôreki era was the 28th of September 1753 in the western calendar. This drama was created by the sakusha Tsuuchi Jihê II and Nakata Mansuke. Tsuyama was the family name of Tsuuchi Jihê I, the founder of the Tsuuchi clan, when he was an actor. "Haru Fukami Iroha Soga" mixed two sekai: the world of the Soga brothers and the world of "Chûshingura". It was a commercial failure.